Click On Horses’ names to see videos. Price’s listed include seller’s 10% commission only, unless otherwise noted. Payment plans and trade in opportunities available. Scottfield Stables is conveniently located in the Lehigh Valley area of Pennsylvania. Fly into the Allentown, Philadelphia or Scranton airports. 2011 Three-Gaited gelding. Full brother to WCC Caraway’s New York Minute. Never lower than 1st or 2nd in any class — Open or Ladies. Teacup canter. Amateur/ Jr. Ex. Ready. $60,000. 2012 gelding by Trust Fund and out of a full sister to Ro & Me’s Lady Godiva. Breathtakingly beautiful with ears that won’t quit! Can’t put his head in a bad spot, the cutest face with loads of expression. Ready to go in harness and just started under saddle, “Rohan” is fabulous fresh face for the show ring. $50,000. Six-year-old mare. Expressive, game, and loads of natural motion. All show horse, all the time. Top prospect for the competitive amateur rider or driver. Undefeated under saddle!! $40,000. NEWS FLASH!! 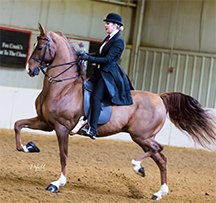 EKL Girl From Ipanema was crowned 2017 Grand National Champion English Pleasure 4 Year Old Mare, and remains undefeated under saddle so far in 2018, adding Park Saddle and Amateur wins to her impressive resume!! 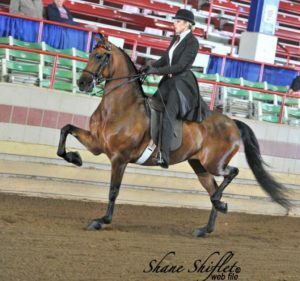 SFS Johnny Drama (Ultra’s Special Agent x LSF She’s Come Undone)– 2013 bay gelding. Extreme in the bridle and very pretty. Beautiful mover, plenty of motion. Best temperament in the barn. English Pleasure/Classic/Equitated. Rides and drives. $30,000. Dragonsmeade Notorious (Dragonmeade Axios x HVK Nobelia)– 2011 bay gelding. Has wins in hand, in harness, and under saddle. Nice size, lots of personality, and a winner again this show season with an amateur in the irons, Marty is ready to win for you! Breeder owned, his price reflects his single ownership, not his quality! This horse is a steal at $12,500 and it’s negotiable. Heartbeat Of Hartland (Spice O Life Right Answer x Halle Berry) 2015 Old Black Gelding. A maternal half brother to the multi-titled world champion mare, CBMF Random Hearts GCH, this colt is just as upheaded, smart and straight forward as his older sister, and is black to boot! Jogs well, buy him now and be ready to collect the blue ribbons in 2018! $25,000. Reference photo to 2014 full brother, EKL Shakedown. 2017 Bay filly with a star. Full sibling to EKL Shakedown (pictured left) and maternal half brother to EKL On The Edge (by SYP High Definition, pictured right). This filly’s dam, EKL Standing Sensation is by Stand and Deliver and out of a Commando daughter, and she throws size, brains, talent and mile long legs! Self- Centered is the eldest of her dam’s only two fillies, and is currently available for $15,000 with an offer strongly considered to a good show home only. all prices include Scottfield’s sales commission only. Trade-in options and payment plans offered. horses from us in the last year!! EKL Visualize (Paladin Pazazz x EKL Joyful Vision) (Video 2 here) 2014 year old chestnut mare. 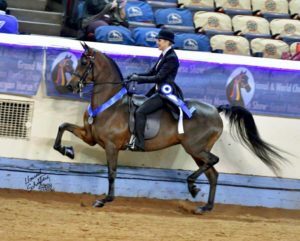 Gorgeous, happy all the time, and already a reserve world champion in hand, this mare is destined for greatness with an amateur or juvenile rider in the show ring! Breeder owned with others coming up behind her, we need to part with this one, and her price reflects the need to move her, despite her exceptional temperament and quality. $40,000. Annie was just crowned the 2018 4 Year Old English Pleasure Sweepstakes winner at the New York Morgan Regional!! SOLD!! Congratulations to the Bartlett Family on their selection of Annie! Agent for sellers, Scottfield Stables. Now to be in training under the direction of Phil Fountain and Julianne Rafferty at Fire Stables, Lenexa, KS. 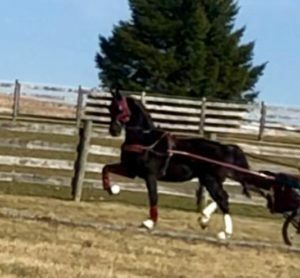 EKL Sophisticated Lady (SpiceOLife Present Tense x EKL Joyful Vision) –2015 English Pleasure/Park Saddle or Harness mare, TALL and leggy, standing just under 15.2 and still growing! Best-thinking and easy everyday, this springy moving bay mare is going to be a star in the Amateur or Juvenile ranks. Finished in harness and under saddle, she will be ready for you to try at Grand National. Be sure to click on her name– you will want to see the video of this one. $75,000 pays everyone. SOLD!! Congratulations to Linda Sheridan on her selection of Tammy! Agent for sellers, Scottfield Stables. Now to be in training at Merin Maggi Stables, Hollister, CA. Fox Grape’s Fort Defiance (Deep Blue x My Chanel)– 2011 gelding. With plenty of wins in Park Pleasure, this 16.2 hand tall gelding is very fronty, super expressive and plenty game. Amateur and/or juvenile ready for the Pleasure or Park divisions in 2018, “Arthur” is priced to sell at $30,000. SOLD!! Congratulations to Joelle Bennett on her selection of Arthur! Agent for sellers, Scottfield Stables. Now to be in training at North Wind Stables, Hardwick, NJ. Flora Anna (Scotland’s Silver Fox x Peri Stardust) – 2012 Gray Mare. Rides and Drives. Prefers an intermediate to advanced rider but has been shown by a beginner. Flo likes to work and has a go forward attitude. Priced for quick sale at $12,500. SOLD!! Congratulations to Karen Greenwell on her selection of Flo! Agent for sellers, Scottfield Stables. Now to be in training at Seven Generations Stables. 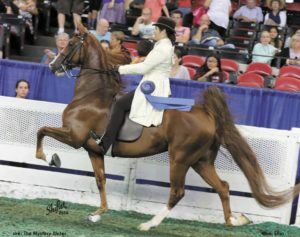 OVT Space Cowboy (Dragonemeade Axios x KJM First Lady) – 2012 Bay Morgan Gelding. One look at this horse’s show record tells you everything you need to know! Never lower then champion or reserve in the Open and Ladies English Pleasure divisions, this talented, long necked guy is ready to win it all this fall at Grand National. The real question is whose curtains his ribbons will hang upon, because this horse is ready to win for any one of us!! $75,000 firm. SOLD!! Congratulations to the Tarnacki Family on their selection of Maurice! Agent for sellers, Scottfield Stables. Formerly owned by DLM Farms, LLC, Binghamton, NY. Agent for buyers and to be in training with Kimber Sharp, Encore Equestrian Center, Brighton, MI. 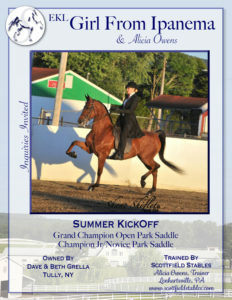 Zenyatta (Stonecroft Masquerade x WTS Nike) 2009 Black Morgan Mare. Always wears her ears,very smooth canters and a wonderful go forward work ethic make this mare a pleasure to work and an easy one to like in the show ring. 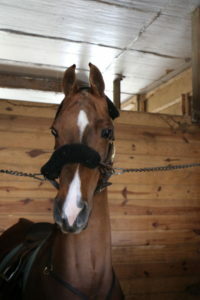 Though she does wear her full bridle, “Zen” lacks the shape in the neck to wear it easily for a beginner. However, ANYONE can ride her in a training bridle, and if you let her go along with her neck up and nose out, she is as steady and happy as they come! With her good work ethic and easy to ride canters, we think she is a STAR for a top academy program, and we have priced her with that in mind! $7,500 to a good home only! I’m In A Tizzy – This expressive, pretty, big bodied 6 year old Saddlebred mare is a diamond in the not-so-rough! Brave and happy, we think she will make a top Show Pleasure horse for the rider who wants to put in a little time, a little money, and wait for her to be finished out! A barn favorite from the minute she arrived, we are hoping this one gets to stay at Scottfield! SOLD!! Congratulations to Melissa Ferrere, Dalmatia, PA, on her selection of Tizzy! Agent for buyers, and to be in training with Scottfield Stables. 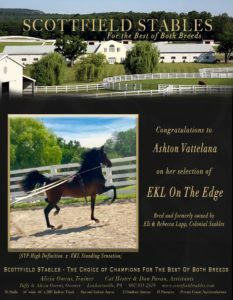 EKL On The Edge – Two Year old stallion by SYP Hi Definition and out of EKL Standing Sensation. Started in harness and looks to be a top English Pleasure/Park prospect. $30,000 SOLD!! Congratulations to Ashton Vattelana of Waynesboro, PA, on her selection of Cliff! Agent for buyers, and to be in training with Scottfield Stables. 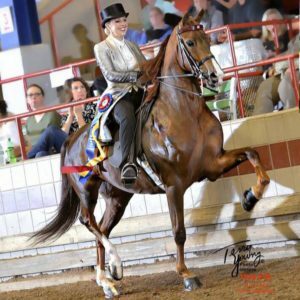 Indian Creek Lady Elisbeth – Ten year old bay mare by Mizrahi and out of three time WC In Hand Mare, Longacres Broadway. A top Classic Pleasure horse with plenty to move up to English PLeasure, this mare is as game as they come and is all show horse, all of the time! $17,500 SOLD!! Congratulations to the Lapp family of Gordonville, PA, on their selection of Indy! Agent for buyer and seller, Scottfield Stables, to join the broodmare band at Colonial Stables, Eli and Rebecca Lapp, EKL Morgans. Call Me A Fox– Eight-year-old mare. Rides and drives. Show quality hunter. Can be used in a lesson program if used often. $2,200 or best offer. SOLD!! Congratulations to the Hubert family of Carver, MA, on their selection of Claudia! Agent for buyers, Scottfield Stables. 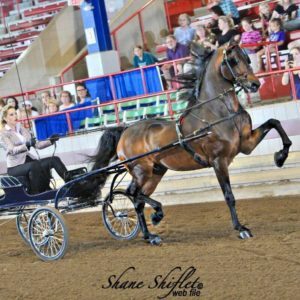 Sasha Fierce – Eight-year-old Park/Pleasure mare. By Designed and out of a Man on the Town daughter. Rides and drives. Great, go-forward attitude. Tall and big-bodied. Expressive. Amateur/ Jr. Ex. Ready. $25,000 negotiable. SOLD!! Congratulations to the Marquita Lovick and receiving trainers at Woodbridge Stables, Stantonburg, NC, on their selection of Sasha! Agent for buyers, Woodbridge Stables. Had To Have – 5 year old Pleasure/Academy mare. 15 hands. Shown last year by a ten year old walk and trot rider in Academy. No spook, easy to ride, very smooth gaited. Lovely in a snaffle and safe for any beginner rider. $7,500 or best offer. SOLD!! Congratulations to the Manito Equestrian of Allentown, PA, on their selection of Star! Agent for buyers, Manito Equestrian. 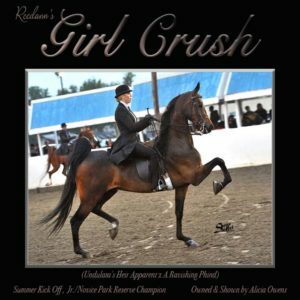 Stylish In Black (Undulata’s Nutcracker x Stylish Heiress) — Eight year old Black Park and/or Pleasure mare. By Undulata’s Nutcracker, this stretchy black mare never drops an ear, and has a show record a mile long in every division from Park to Country Pleasure. Suitable for any rider who likes a go forward, go get ;em kind of show horse. $40,000. SOLD!! Congratulations to the Chen family of Flemington, NJ, on their selection of Sadie! Agent for buyers, Kierson Farm. Five-year-old mare. Maternal Half sister to Reedann’s Blackberry Treasure. Open Park. Perfect stall manners. Won her first time out in the Open Park division. Louisville contender quality. $150,000. SOLD!! Congratulations to the Kachel family of Milton, WI, on their selection of Aria! Agent for buyers, Clean Sweep Farm. Queen’s Out Of Bounds – Ten-year-old Classic Pleasure gelding. 14.3 and beautiful headed, trimmed in chrome and tons of ring presence. Super safe, uncomplicated, honest… he’s the whole package and perfect for a new or timid rider of any age or size. A steal at $17, 500. SOLD!! Congratulations to Ivy and Ella Murphy of Flemington, NJ, on their selection of Auggie! Agent for buyers, Kierson Farm. LSF She’s Come Undone – 15-year-old English Pleasure mare. Upheaded, fearless, spunky. Rides and drives. Proven broodmare. Priced to move with special consideration given to a loving home. Super easy, super sound. $8,500. SOLD!! To remain in training with Scottfield Stables. 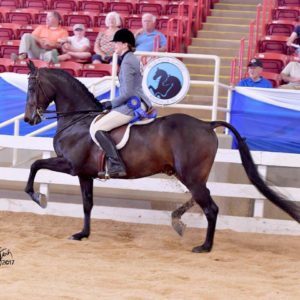 Tallulah Uptown – Seven-year-old Hunter Pleasure mare. Very beautiful. Expressive. Impeccably finished. Top 3 finishes at every major show, including New England Regional and Morgan Grand National. Once-in-a-lifetime horse. Amateur/ Jr. Ex. Ready. $35,000. SOLD!! Congratulations to the Valeria Morgans, LLC, of Traverse City, MI, on their selection of Tallulah! Agent for buyers, Ridgeback Farm. Ultra’s Special Delivery – 15-year-old Park Saddle gelding. His show record speaks for itself. 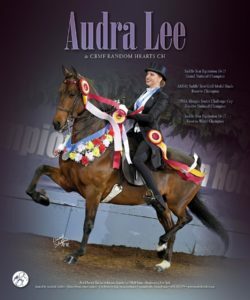 A top horse for multiple junior exhibitors, with World and Grand National titles from Walk and Trot, English Pleasure, all the way up to juvenile Park Saddle. An honest 16.1. Easiest horse in the barn to work. Perfect every day. SAFE. $8,500. SOLD!! Congratulations to the Biron family of Buffalo, NY, on their selection of Del! Agent for buyers, Champion Hill Farm. Castleridge Calliana– Seven-year-old black mare. Green-broke to ride. Very nice quality mare for not a lot of money! Will be finished as a hunter, western pleasure potential down the road. Good home a must!! $3,750 SOLD!! Congratulations to the Manito Equestrian of Allentown, PA, on their selection of Callie! Agent for buyers, Manito Equestrian. Arethusa – Seven-year-old mare. 15.2 hands. Small but impressive show record, with wins in English Pleasure and Park saddle, both Open and Amateur. Royally bred, by Mizrahi out of the Beethoven daughter Instrumental. Rides and drives. Nice to be around. Always wears her ears. $25,000. *Would consider trade for top 13 & Under English Pleasure or Classic mount. SOLD!! Congratulations to the Valeria Morgans, LLC, of Traverse City, MI, on their selection of Rockette! Agent for buyers, Ridgeback Farm. 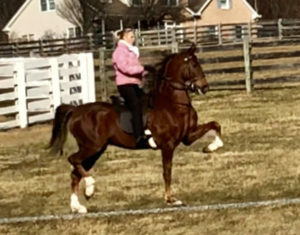 EKL Poetry In Motion (Illegal Motion x Moreland Monique) – 2014 carriage driving and western pleasure gelding. 14.3 and bay with just enough white to be eye catching, Rambo has logged lots of cross country miles and has been hooked to a carriage and gone down the road with no trouble. Good ground manners. Breeder owned and with others ready to come into the training barn, you can get this solid gelding for a steal. No reasonable offer refused. $7,500 OBO SOLD!! Congratulations to the Rosier family on their selection of Poetry In Motion! Agent for buyers, Breezy Knoll Farm. SFS Hopelessly Devoted– Six- year-old bay mare. Honest. Consistent. Super sound in body and mind. Rides and drives. Extensive cross-country experience in harness. Truly could go in any division. Has been shown as a hunter, but prefers to pick her head up. Amateur/ Jr. Ex. Ready. $15,000. SOLD!! Congratulations to the Adrienne Hariry of Slatedale, PA, on her selection of Olivia! To remain in training at Scottfield Stables. 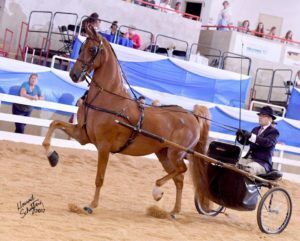 Johannesburg– This 8 year old gelding has carried multiple riders to top prizes from New England all the way to Oklahoma. With his size and expression, he no doubt will continue his winning ways for you! Amateur/ Jr. Ex. Proven. Two times a Reserve World Champion and also a Grand National Champion, this horse is priced at $12,500 (plus all commissions) for the first 30 days he is here to ensure a quick sale! (Arrived Feb 1st) SOLD!! Congratulations to Mike and Mindy Hill of Akron, NY, on their selection of Gus! Agent for buyers, Champion Hill Farm. EKL Shake It Off (Rowenda Boogie On Down x EKL Secret Delivery)– 2 year old Gelding with lots of show horse attitude. Looks to be a good English prospect. $30,000 pays two commissions. SOLD!! Congratulations to Fire Run Farms of Snohomish, WA, on their selection of Brody! Agent for buyers, Fire Run Farm.